Some 32,000 students a year head to Park Square Theatre's two-stage downtown St. Paul space to see theater that is just for them. Many of Park Square's regular shows have a handful of student matinees, but there are also several shows that are primarily for students, with few, if any, evening performances for us grown-ups. 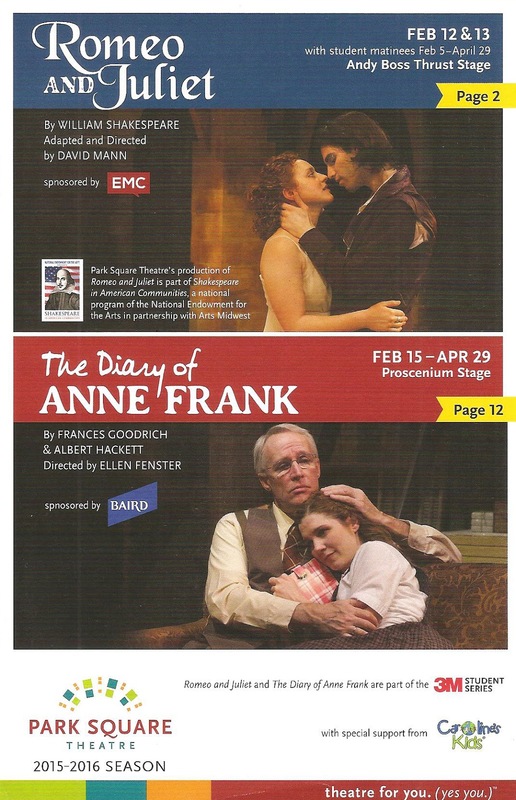 But because I'm not a normal grown-up, I was able to get into a student matinee of one of the two shows for students this spring, The Diary of Anne Frank (the other is a captivating 90-minute Romeo and Juliet, which I saw last year). A theater full of hundreds of teenagers creates a much different atmosphere for watching theater, and watching the kids watch the play is almost as entertaining as watching the play itself. The Diary of Anne Frank is a play that must appeal to teenagers, with a main character that is herself just a typical teenager, despite living in hiding during the Holocaust. Anne's story and spirit are brought to life in an engaging production that's a pleasure for kids and grown-ups alike. Anne Frank is perhaps the most famous victim of the Holocaust, although only one among millions. Her story is remembered due to the diary that she kept while in hiding in Amsterdam, and her father's determination to have it published* after his entire family and many of his friends were killed in concentration camps. Anne's writing gives a face and a name to the unfathomable number of deaths, and gives us a window into the horrific experience. The stage version of her story, written by Frances Goodrich and Albert Hackett in the '50s, does the same. The play is bookended by Mr. Frank's post-war finding of the diary, with the bulk of the play taking place in the two years Anne, her older sister Margot, her parents, Mr. and Mrs. Van Daan and their son Peter, and the dentist Mr. Dussel lived in a small space above Mr. Frank's business. Anne was 13 to 15 years old during this time, and despite the circumstances, experienced all the things any teenager does as she began to grow up and think about the world and her place in it. Even during the Holocaust your mother doesn't understand you, you can never live up to your older sister's example, your roommate is annoying, the boy you like is confusing and wonderful, and the future is full of dreams and possibilities. That Anne's dreams for the future never came true only makes her dreaming even more poignant. Well with the exception of one dream, the wish to live on after she dies, which has most certainly come true. I'm not sure there's anyone better to represent Anne's effervescent and irrepressible spirit than Sulia Rose Altenberg, as she flits and twirls across the stage one moment and bursts out in anger at the annoying grown-ups the next. Anne, or at least this fictionalized version of her, is a person who wears her heart on her sleeve and feels things most deeply, which Sulia conveys to beautiful effect. Other highlights among the strong cast include Michael Paul Levin and Laurie Flanigan Hegge as her warm and understanding parents, Quinn Shadko as the good older sister Margot, Charles Fraser bringing some comic relief as the unique individual that is Mr. Dussel, and Kevin Fanshaw as Peter, who has a sweet and awkward romance with Anne, born of circumstance. As directed by Ellen Fenster (who once again succeeded in making me cry), the entire ensemble brings such a range of emotion to this story, from hope and joy, to boredom and irritation, to true terror at the state of the world and their future. All of this takes place on Gabriel Backlund's clever and effective set that makes the Achterhuis look like a cozy place to camp for a few weeks, although perhaps not for a few years. One of the cool things about student matinees at Park Square is that before the show one of the actors (in this case Peter Simmons, who plays one of the people hiding the Franks) comes out and talks to the kids, welcoming them, encouraging them to "laugh, listen, and enjoy," and asking to collaborate with the cast to create the experience of theater. He assures these young theater-goers that theater cannot happen without them, which seems to me a great way to make new theater fans. The kids were marvelously well behaved, mostly quiet and attentive during the somber moments. But given any excuse for laughter (the annoying Mr. Dussel, Anne throwing herself on the floor), they erupted in what felt like a welcome release from the tension. Their reaction to Anne and Peter's kiss, which must have seemed terribly tame to them, but still perhaps relatable, was priceless, as a chorus of taunting "oohs" rang out. These teenagers seemed engaged in teenager Anne's story, and I heard more than one exclaim "that was so sad" after the show, repeating Anne's inspiring and hopeful quote, "In spite of everything, I still believe people are really good at heart." Both The Diary of Anne Frank and Romeo and Juliet continue through the end of April. For information on how to bring your students to see a play at Park Square, visit their website. Park Square's theater for grown-ups currently includes Love Person, playing in the evenings on the same stage through April 10, and the upcoming Six Characters In Search of an Author on the downstairs stage beginning April 19.